Sea of Galilee & its Ancient Sites is part of the Tentative list of Israel in order to qualify for inclusion in the World Heritage List. As Assif indicates in his earlier review, the extent of this site in relation to others on Israel’s T List is not clear. Among other mentioned sites, we visited that of Capernaum and I will limit this review to it. 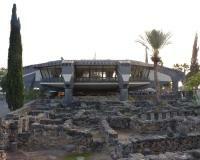 Now, the ancient site of Capernaum features in the descriptions of 3 of Israel’s T List sites. This one, the “Galilee Journeys of Jesus” and the “Early Synagogues in the Galilee”. Whether it would ever be intended to appear in 3 different inscriptions if Israel should be so lucky I know not. First a warning – our National Parks Pass included entry to somewhere called “Capernaum”. When we reached the approximate area for the site as marked on our map, we gaily drove until we saw the National Park logo/sign for “Capernaum” and drove into a large car park with paths leading down to the lake – and it was all “free” even without a pass!! However, after some wasted time wandering about but finding nothing of relevance we contacted an NP employee to discover that this was the wrong place! As the NP Web site for “Capernaum” states “The main area of the national park, which covers approximately 80 dunams (20 acres), is northeast of the antiquities site. The INPA has prepared the area to assist and complement the visit to the antiquities. The national park will become part of the new promenade, 3.5 km long, which connects Capernaum and Ein Sheva (Tabgha). A dock has been built near the antiquities site, which allows visitors to sail to Capernaum from Tiberias and Ein Gev”. What we had come to see were the ruins of a fishing village dating originally from around 200BCE Surprisingly, it wasn’t discovered until 1838, after which a series of excavations took place through the 19th Century. Along the way the Franciscans bought the land from the Bedouin – and own it to this day. 2 overlaid synagogues, with the first dating back to the 1st century, were uncovered and presumably would be the inscribed aspect of any nomination as part of the “Early Synagogues of the Galilee”. Interestingly, the later synagogue (4th/5th C CE) is signed as being “Built over the Synagogue of Jesus” – a reminder that this is a site run by Christians primarily for Christians but also of course that Christ was a practicing Jew. Further excavations, through to the 1960s, uncovered the remains of a Roman town. Then, most significantly, came the identification of a series of early Judeo-Christian churches with, finally, under them all - a house from the 1st Century CE. This, it was/is asserted, was the house of St Peter – the significance of this was that Christ is believed to have stayed there and lived at Capernaum where he met his disciples and carried out his “Ministry”. In the half century after the crucifixion the central room of this house “had been enlarged and embellished. (This it was believed was the room)… used for the gatherings of the first Judeo-Christians, in which Christ’s presence in Peter’s house was commemorated; the place itself where, according to the Gospels, a number of miracles took place”. Later on the room was developed from a place of domestic worship into a series of ever larger octagonal churches through to around 5th Century. The net result of this “discovery”/interpretation was the development of Capernaum as a significant place of pilgrimage in the Holy Land. This has resulted in the construction of a rather strange church on the site, which was opened as recently as 1990. It “hangs” on 8 legs directly above the original octagonal church – with its single hall rather like the body of a spider supported by the legs (photo). Thus its construction in no way damages the original remains. The main hall has a rectangular glass-covered opening in the centre which looks straight down upon the original church. The concept was “interesting” but I can’t say I liked it – it is not, to my eyes particularly pleasing and “hangs” very low over and dominates the original remains in an unfortunate way. But it and the adjacent Synagogue were incredibly popular with the arrival of a constant stream of coach parties. During our trip around the early Christian remains of the Holy Land we became rather sceptical about the authenticity of many of them. Right from the earliest start of pilgrimages from Rome around the 4th C CE it has been “necessary” to “discover” places directly related to New Testament events, the Crusades provided another stimulus as did the 19th and 20th centuries. The fact that some events have contending locations (with the Orthodox churches often seeming to be the ones with the alternative views!!) doesn’t exactly add credibility to the assignments. Whatever, the fact that this location was believed to be the location where Christ had met with Peter et al was clearly of great religious moment to many of the visitors. Even if you don’t share their views it is an interesting place to visit and should (with its Synagogue etc) figure in any “Galilee-related" nomination(s) which might emerge. I cannot find out what exactly the proposed area should include. The Sea of Galilee, regardless of its Chritsian holy status, is indeed surrounded by numerous ancient sites. Their intergrity is questionable though, mainly due to the fact that some of the territory (the Golan hights) is internationally considered as an occupied Syrian territory. On the Israeli (internationally recognised) side several sites (Capernaum, Hurvat Minnim, Hammat Tiberias) are already proposed under other titles (ancient synagogues, Christian pilgrim routes and Hurvat Minnim respectively). Tiberias is now a modern town, its historic Mamluk-Ottoman centre having been almost completely demolished by the Israeli army during the 50s. Whatever is left of it is far from impressive and lacks integrity. New excavation of Roman Tiberias are underway at what is now called Barko Park. There is not much to see there yet. Nearby Hamat Tiberias offers a nice synagogue mosaic, but it is not mentioned in the description. Capernaum is a popular pilgrim site and boasts a magnificent marble synagogue as well as the remains of a Roman settlement. Tabgha features two churches with archaeological findings - the mosaic of the Bread and Fish is the better known of the two. There is now a scenic walk along the shore connecting Tiberias and Capernaum passing through Tabgha and Hurvat Minnim. As you can probably sense reading my review, I cannot really grasp the unifying element that would justify a common inscription of the sites, but maybe a more detailed description would shed some light how this could be argued. Notwithstanding, the fact that the lake is a source of a political conflict could probably suffice to exclude the site.